Text: I did not visit the cinema very often during my childhood. The seats cost four to six pence during the week, so I would be taken by my mother or my father. My mother would take me in the afternoon so that we could get home for her to get dinner on. I always knew why my father took me to the cinema. He would always fall asleep soon after arrival and would sleep through until it was time to go home. My father relied on me to wake him up at the appropriate time and then tell him what the film was all about. I think that, maybe, at this time I started the process of learning to be a film editor for which memory is everything. My principal visits to the cinema were on a Saturday morning. It was a ritual which started in 1937. Around eight o’clock in the morning, I would approach my mother for some pocket money. She might give me two pennies, sometimes three, my dad would give me the same. On a bad week, I would have as little as three pence in total. Then I would go up to my Granddad’s room and ask him if he had any money for me to go to the pictures. He would ask me to pass him his small terracotta jar, with a lid, from here he took out some farthings and he would count out four. I had to have four pence to get into the Moorish styled cinema, the Alcazar which started at nine in the morning and ran until midday. Here we would see a couple of “B” movies about kids and animals and then a large number of serials like “Tailspin Tommy”, “The Perils Of Pauline” and “Flash Gordon” and films such as “Tarzan” with Johnny Weissmuller, and the “b westerns” of “Buck Jones” and “Tim McCoy”. Of course, they were all designed to get us back there next week. Mostly these cliff-hangers were cheating us. Tailspin Tommy would be left plunging to earth in a dive that he could not possibly pull out of. Next week, he would be seen about a hundred foot higher and he pulls out of the dive without a problem. Thus I occupied my Saturday mornings. The audience were exclusively children, no adults were allowed. Most of the children were restless and rowdy. Frequently the noise of the audience would be greater than the characters on the screen. At this point, the resident warder would march down the centre aisle shouting “Quack”, “Quack”. With my fourpenny ticket, I could sit in the circle, far away from the rabble below. They were so bad, fights were not unknown among the roughest of them. If I could not have got fourpence to sit in the circle, I would not go. It took me a long time to work out that the warder was shouting “Quiet”, it really did sound like “Quack”. If I had a good day and had rustled up another two pence, I could join the “tuppenny rush” at the Hippodrome across the road. The management of the Hippodrome, early experts in marketing, arranged to open their performance thirty minutes after the show ended at the Alcazar. All those children trying to go from the Alcazar to the Hippodrome would evacuate the former at high speed, run down to the crossing, over the road and queue up outside the latter hall of entertainment. Traffic was held up while this mob moved from one cinema to the next. The main reason for the rush was that the Hippodrome only held half as many as the Alcazar and you couldn’t risk the chance that more wanted to go to the Hippodrome than it could hold. 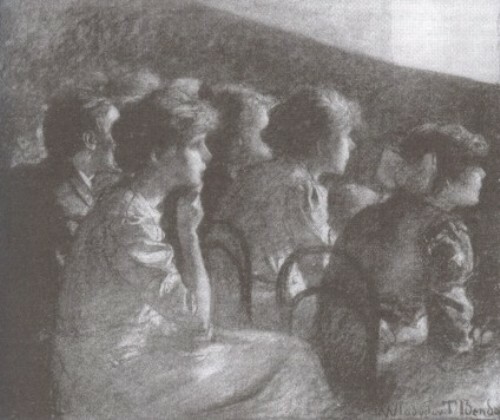 In the Hip’, the films were older; the rowdiest of the Alcazar audience were sure to attend (their parents probably suffered considerable hardship raising the extra two pence, just to get rid of them for a few more hours); there were broken seats; seats with the most outrageous mixtures of spilled food, forcing us to inspect each seat before sitting down. The projector frequently broke down, the audience would go wild. They would shout “Ooh, Ooh, Ooh” until the picture came back. For me there was no refuge in a circle, there wasn’t one and there was no “Quack” man. In the Hippodrome, there was only the occasional cry of pain as a rowdy became the recipient of a thick ear. The warder in the Hip’ was silent, but quite active. I don’t know why I went there. Sadly, the Alcazar was bombed in a very early wartime raid on North London on August 23rd 1940, while the Hip’ was pulled down, much to the relief of the local populace. Comments: Terence Gallacher is a former newsreel and television news manager and editor who now documents his career through his website http://terencegallacher.wordpress.com. The Alcazar and Hippodrome were in Edmonton, London. The post is reproduced here with the kind permission of its author. This entry was posted in 1930s, Memoirs, United Kingdom, Web texts and tagged Children, Cinemas, Food and drink, Frequency of attendance, London, Matinees, Misbehaviour, Money, Noise, Parents, Prices, Serials, Staff, Terence Gallacher. Bookmark the permalink. Gallacher’s viewing seems to have been mainly American films (or perhaps those are the films he best remembers). Did the UK studios produce serials, cartoons, and adventure stories, the types of film that would be shown during the day for an audience composed mainly of children? I’ve seen UK films in which characters watch newsreels in theaters…can’t think of the titles right off the bat. UK studios produced films for children more from the 1950s onwards, particularly via the Children’s Film Foundation, whose films I can remember at Saturday morning shows in the late 60s/early 70s. I can’t think of British serials being made in the 30s, but there were a few cartoons, but they were way below American standards and had little distribution. Rank tried to challenge the US with GB Animation Films in the late 40s, bringing in David Hand (ex-Disney) to run the show, but the results – e.g. the Animaland series – were really poor (gorgeous colour through). UK kids wanted US films, and got ’em. Picturegoing is an ongoing survey reproducing eyewitness testimony of viewing pictures, from the seventeenth century to the present day. Enter your email address to subscribe to Picturegoing and receive notifications of new posts by email. Are Movies Going to Pieces?